At heelstone.com’s poetry site you’ll find Tarot Poems by Mike Timonin, with Art by Cindy Duhe, presented in a very tarot-appropriate way. Click on the rapidly changing tarot card images and you’ll be taken to a poem determined by the shuffle. Want another card and poem? Shuffle the deck again. You’ll also find a poem by Michael Gerald Sheehan for every card at Moon Path Tarot. Tarot Poems by Donna Kerr from her book of poetry Between the Sword and the Heart. Tarot Poetry by Rachel Pollack. Here is one of the oldest tarot poems in existence: a sonnet by Teofilo Folengo, appearing in his 1527 work Caos del Triperiuno written under the pseudonym Merlini Cocai. The work includes a series of poems representing the individual fortunes of various people as revealed by cards dealt them. The summary sonnet below mentions each of the 22 Trump cards, which I’ve referenced by their number to the right of the line on which they appear. It helps to understand that Death is female in Italian, la morte, and Love (Cupid) is male. Love claims that although Death rules the physical body, Love never dies and therefore death is but a sham. Translated by Marco Ponzi (Dr. Arcanus) with help from Ross Caldwell, members of Aeclectic Tarot’s TarotForum, and by comparisons with the translation found in Stuart Kaplan’s Encyclopedia of Tarot, Vol II, p. 8-9 (read the discussion here). 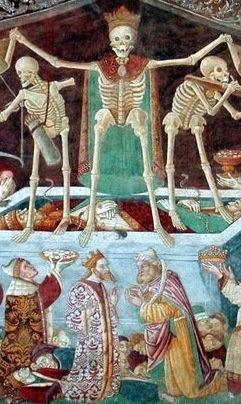 The first picture is from a 1485 Triumph of Death fresco on the wall of a Confraternity Chapel in Clusone, Italy. It depicts Death as an Empress before whom all others bow. 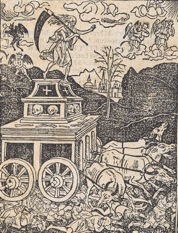 The second picture is from Savonarola’s Sermon on the Art of Dying Well, published circa 1500. See the translation of one of Folengo’s fortune-telling sonnets at taropedia – here. Thank you, Mary, for posting this. I’d actually forgotten that article I did, and more importantly, the possibilities it opens. In a few weeks I will be leading a Tarot For Writers workshop at Goddard College, where I teach creative writing. This will be fun to include. I also enjoyed the Journey poem, which I hadn’t known. It seemed to me to get better, and more subtle, as it went along. sort of like the Fool himself. meanwhile, I was working some time ago on the idea of blessings for Major Arcana cards. In Jewish tradition there is a blessing one says for all sorts of occasions, from getting up in the morning, to drinking wine. It struck me it might be interesting to come up with a short blessing to say on receiving a card in a reading. For instance, if the Magician card appears one could say Blessed are you, Source of all Light, who makes us vessels of power. Or the High Priestess–Blessed are you, Silent One, who sits in the Gateway of Mystery. Some are direct, such as the Hermit–Blessed are you, Lonely One, who holds light on the mountain. And some are more esoteric, like this Emperor blessing–Blessed are you, Builder and Architect, who creates the four corners. And here’s a poem I wrote recently, when Awakening from the Shining Tribe deck (traditional title–Judgment) fell out while shuffling. The sky is singing to you. The earth is singing to you. Whispers fall from the Great Above. With the surge of the sea. I love the idea of the Blessings. What a wonderful way to experience a Tarot reading. You get the Devil and say, Blessed are you, oh Scary One, who terrifies the s— out of me. (I couldn’t help myself!) Actually, an honoring of the Devil as a Blessed Being could help transform our knee-jerk reactions to that card: Blessed are you, Guardian of Hidden Treasures, who values the material world. A wonderful idea to bless the cards received in a spread. Something new to try. And a nice post too! Thanks! I have ‘The Shining Tribe’ but will search for other books containing your poetry, Rachel Pollack. Thanks. Oh, I just *love* the blessings! Rachel’s actually *sing* with poetry. I am living in bliss right at this moment, mashed thumb and all. Years ago I copied into my Tarot notebook 78 two-line poems – one for every card in the Tarot deck. This sonnet by Teofilo Folengo (1527) shows us that the Tarot images/icons were not for games only, at least by the early sixteenth century. The trumps are the symbolic basis of a good philosophical poem, wherein Love proclaims that its fire can be tempered by those who live under its star, and that Love regards death as only a trickster. I love the way the “conventional” Tarot – and especially the Mantegna Tarot – are a summary of Renaissance spiritual understanding and the world-concept of the time. The sonnet illustrates this idea further. Glad to have your contribution. More poetry, please! Holy Father, Bishop of Rome. There are illustrations to this on my blog, with notes on the medieval theory of lights in the comments, plus part of a poem by Vincenzo Imperiali, c. 1550 with links. Kendal’s book looks like a really good example of how to use tarot in a very creative and interesting way in poetry. Thank you so much for mentioning it here. That open on forbidden lands. Would will to know his hour to die.